Mountains of lodge pole pine, small streams, and flocks of midnight spirit birds reflected in my sunglasses as the silent shadow of my pickup found its way down the highway to the valley of ten thousand haystacks. Woven in the landscape lies Wisdom, a small town with a couple of gas stations, cafes, and a general store decorated with horseshoes. In the center of town stands the Antlers Bar; its rough pine board siding, bleached antlers, and a blue neon beer sign welcome strangers. After hours on the road breathing pickup dust Steve and I thought it would be a great place for a quick beer. Steel gray cigarette smoke, cracking pool balls, and country western music filled the air. The bartender brought us a couple of tall cool drafts and we asked about fishing. Leaving the stuffed deer heads, blackhats, and cigarette smoke, the scent of river willows and thoughts of leaping trout led us down the highway. We were to meet my father at the Wise River campground that evening. After a couple hours on the road the lights of Wise River glittered in the distance. My father was waiting in the dark and thought it would be fun to eat at the Wise River Club that evening. Big Hole Burgers and the Chuck Wagon Special were our pick of the menu. On the way back to camp it started to snow. Next morning it was white and too cold to fish. Hot coffee and pancakes eased out trout thoughts. We drove around Wise River and visited Phil Wright’s Complete Angler. A wood stove and thousands of flies greeted us. I picked a dozen to add to my fly box. That evening we drank beer with jolting Jack Daniels chasers as Steve acted out jokes and father told stories of hunting with his Winchester. Sun replaced clouds in the morning and the snow melted by noon. The winding neon Big Hole was ready to fish. I opened my fly box and picked a black and yellow Montana stone fly nymph. I eased into the cool water feeling my way over slick riverstones. I worked my way down river and noticed a deep run behind a huge boulder. Bubbles and foam showed the place to cast. I laid out a long line with my Winston and the fly hit the foam. Instantly a giant red sided rainbow leaped into the Montana sky and fell back into the river. I followed the fish as it made several powerful leaps and runs. Slowly, it tired and I slid it over the wet riverstones. Thousands of black spots and a crimson stripe marked it to be the river king. I gently eased it back into the Big Hole and walked away in a purple haze. 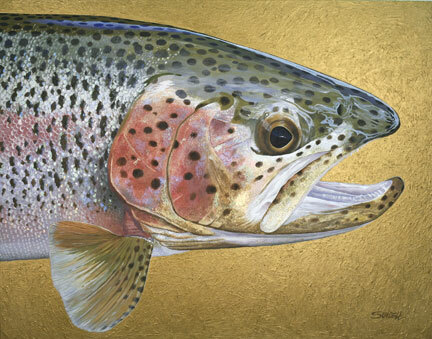 Note about Bern Sundell’s painting: “River King ” is acrylic on canvas 56″ wide by 44″ wide. Original paintings and prints available at RiverStone Gallery. Copyright Â© Bern Sundell 2007. All Rights Reserved.